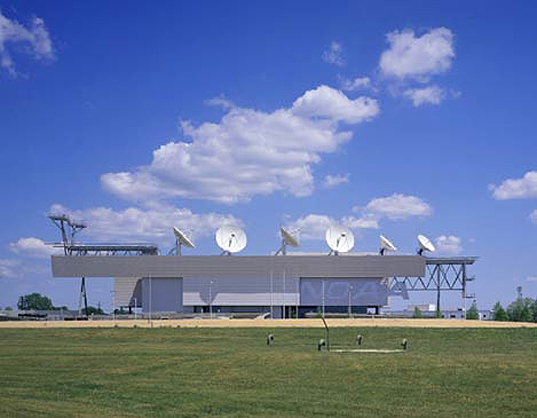 Designed by the EYP design firm, the National Oceanic and Atmospheric Administration’s Satellite and Operations Facility in Suitland, Massachusetts, is a marvel of efficiency and sustainability. A commission of the U.S. General Services Administration, the facility has earned LEED Gold certification. The NOAA and its control center monitors the changing environment from the ocean floor to surface of the sun; tracking weather forecasts, storms, coastal restoration and other marine commerce. EYP constructed the massive 208,271 gross square foot building to be partially submerged below the ground. The building blends easily with the surrounding landscape, but more importantly, its partially submerged construction enables it to utilize the ground’s insulating properties to conserve energy. The roof is covered with 145,000 square feet of green sod, which further insulates and improves thermal efficiency. The EYP also designed the facility to use daylighting, and energy efficient lighting in the evening. Raised floor air distribution cools the interior, and air and water economizers reduce energy consumption throughout. The EYP firm was attentive to both the environment and energy concerns throughout the entire duration of the project. Wait, wait, isn't this in Suitland, *Maryland*? If anyone has questions, feel free to ask me, I currently work at the National Ice Center, located in the above mentioned building. This place is in Suitland, Maryland, near the Census building.